The two-day PlayStation Experience (PSX) 2016 event took place over the weekend, and while there had been some anticipation among the Shenmue community for something new on Shenmue III to be revealed, in the end this turned out not to be the case. I was among those who been hoping that Shenmue III would get a mention. There was the tweet from Cedric Biscay suggesting the possibility of something being shown in December, together with various other factors in the weeks and days before the event that all appeared to point to a reveal at PSX (confirmation bias!). Furthermore, PSX seemed to "make sense" as it would have provided a high level of public exposure for the game, and timing-wise would have slotted in nicely ahead of the release of the trial version due some time in 2017. However while the outcome is somewhat disappointing, the absence of Shenmue III from PSX was always within the realm of possibility. 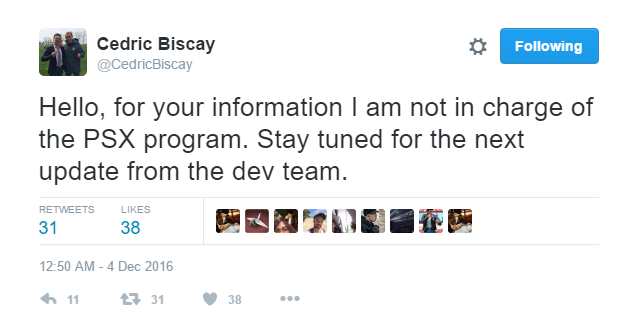 In his original tweet, co-producer Cedric Biscay had tried to keep expectations in check by stating that a showing was not confirmed, and would only be "if we are ready". However his follow-up message after the show indicates that his message may still have been taken a little too positively by some fans, as he comments that he may have had "too much optimism on my side as a result of the information made available to us" [auto-translated]. As a side-note, I think Cedric has been doing a great job in interacting with fans, but it is also somewhat unfair that he should have to. The project would really benefit having someone in a dedicated PR role to handle messages to the public, which would take the burden off him and allow him to focus on his role as co-producer. In any case, in terms of what to watch for next, he advises fans to stay tuned for the next official update - and for my part I am taking these words at face-value without looking for any hidden meaning. So it would appear that it was not a case of something having been pulled from the event for some reason at the last minute (as has been reported to have happened with a trailer for Shenmue III that had been prepared for E3 earlier in the year). While the absence of Shenmue III from PSX 2016 may have been surprising, I trust that there was a good reason for it. Perhaps a decision has been made to target another upcoming event (MAGIC Monaco or E3 2017 being likely contenders in this case) or to share the next trailer directly with backers in a Kickstarter update. And the main facts have not changed: Shenmue III is still coming, and backers been have been kept informed about the project via the monthly Kickstarter updates which have consisted of a good mix of interviews, developer updates and the occasional lighter update. It does feel time for a decent update on the game development itself, and I would welcome a significant update at the end of December to end the year with a bang. This would generate a positive buzz for the year ahead (during which the trial version is also scheduled). Should we hold our breath for the end-of-December update? When do you think would be a good time to release a trailer? Leave a comment below. Thank you Switch for keeping the good work :) Keep going! Thanks for your support, Vanjoelsan. Love this blog site Switch, please keep up the amazing work. Yes, it is easy to overlook factors like this and get swept up in the eagerness to see something new. Just wanted to say I'm really enjoying this blog Switch, keep up the good work! I thought there was going to be Shenmue 3 at PSX as 3rd December was 30 years to the in-game day since Ryo's journey began. Thought the timing was too good to not be capatalised in some way, but alas not. Was initially disappointed but it's not a disaster and hopefully there's lots of good stuff ahead to look forward too! Yes, there really seemed to be a lot of "clues" to Shenmue happening at PSX - even the L.A. Kickstarter dinner was apparently rescheduled to this month, suggesting Yu Suzuki might be in town. But as you say, it's not a big deal and there are without doubt plenty of exciting times to come. Glad you're enjoying the blog, thanks for your support!